In a recent post, I outlined the model I use at Mindbox Studios to help innovators embarking on a software journey get a handle on their innovative software needs. Visionary software owners often ask “how much is my software build going to cost” without having all of the requirements yet. The first step to narrowing in on an answer is understanding the organization and the process they want to facilitate with software, which is often core to a startup’s business model. Before breaking ground on a software product, the business implications should be relatively well-defined. A team must understand how to define success for the implementation to build the correct product. The technology will directly impact the business goals and should be created with them in mind. Accurately and concisely communicating your organization’s vision is key to ensuring stakeholders are on the same page. Team goals and initiatives will be directly influenced by this vision, which should be revisited as often as necessary to keep the team aligned. Vision can be communicated through a variety of formats. 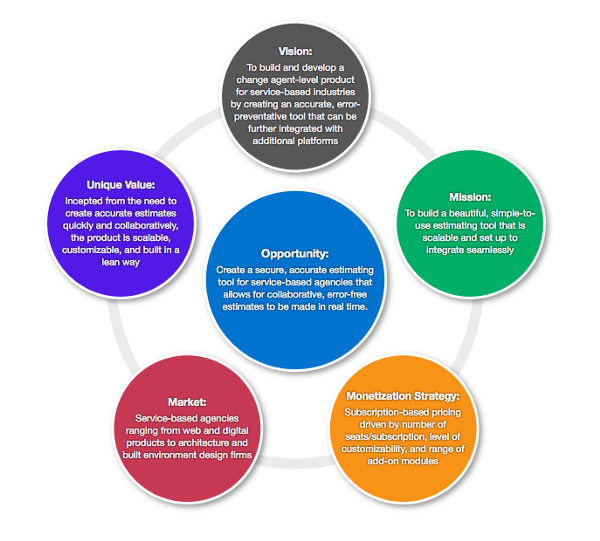 It should succinctly describe what makes the organization unique from others in the marketplace. What is the big problem you solve? What is your solution and why is it unique? How crowded is the market? An Executive Summary is a helpful tool to use for this purpose. Other formats, like the one pictured above, can be useful to use internally to keep teams aligned as new knowledge is gained. Depending on the type of software being developed, organizational leaders often share a business plan to inform the product planning process. The Business Model Canvas is a simple, easy-to-read framework for organizing a business plan. The simple block format allows team members and stakeholders to stay aligned and provides a common language to discuss business model changes. The canvas visualizes a data flow from right to left. Customer relationships and channels connect customer segments to the value propositions. On the left, key activities and resources create valuable partnerships. When collaborating on business and product goals, team members should understand the primary business customers and what motivates them. Planning and constructing fictional customer personas is a helpful way to understand the potential platform users better. Personas can be presented to the team using many formats depending on the end goals, from a simple spreadsheet to a nicely designed presentation document. 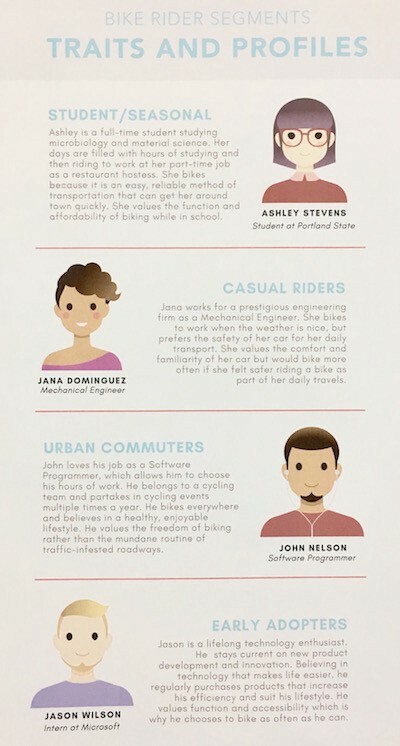 The example on the left shows how Boogie Bike, a Eugene-based bicycle accessory company, presented their personas. In this example the team outlined four different types of users, inventing relevant details to help team members and stakeholders get to know each segment. Creating realistic user personas helps ensure that the product being developed will meet the needs of the end users, so it’s important to do your market research first. Identifying the core value proposition is essential for software-based startups. It can still be a useful exercise for established organizations depending on their needs. If a Business Model Canvas has been created, a Value Proposition Canvas can be outlined to focus in on the most lucrative value propositions and customer segments. This exercise helps identify how well you understand the key problems the organization solves. The Value Proposition Canvas template provides a format to envision the needs of the primary customers so that efforts are focused on the right products and services. It can also be used to test different value propositions and primary customer segments as you narrow in on the requirements for a minimum viable product (MVP). After looking at the company and its customers, we can focus in on how the software will directly help the business. What are the most critical things the platform must be able to do for the business on Day 1? Do you need to sell products or services? Are you offering a subscription to access content? Do you want to automate or optimize part of your internal workflow? Are you offering software as a service (SaaS)? This list will provide a basis for planning the product requirements. Getting to know the organizational needs on this level allows the product team a much greater chance of making appropriate judgment calls throughout the production process. This understanding reduces product planning and development costs on any software project. After analyzing the business, a market analysis can help the team understand the precise opportunities being pursued and how to create a scalable, competitive product. I have outlined that process in the first post of this series. In the next post, I will talk about the Market Analysis content in detail. 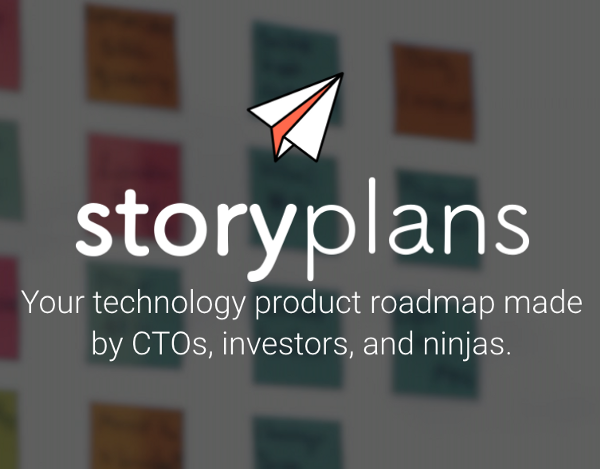 Before asking for an estimate to build an innovative software platform we recommend a Story Plan. Get in touch if you are interested in working together. This post is the second in a series. Check out Part 1. Follow me or Launch Lab to be notified first of new posts in this series.